Introducing the AromaTouch Diffused kit! Plus, in July you will get a FREE (EXTRA) Wild Orange oil with a $100 wholesale enrollment order! You can share with a friend since you will have two! The warm, woody aroma of Balance, doTERRA’s grounding blend, creates a sense of calm and wellbeing. We perfectly blend Spruce, Ho Wood, Frankincense, Blue Tansy, and Blue Chamomile with Fractionated Coconut Oil to offer an enticing fragrance that promotes tranquility and relaxation. Spruce, one of the oils in Balance, was used by Native Americans for health and spiritual reasons and is still used today to bring harmony to the mind and body. Ho Wood, Blue Tansy, and Blue Chamomile can ease anxious feelings, while Frankincense provides a grounding, balancing effect on emotions. +Begin your day by putting Balance on the bottom of your feet to promote feelings of calmness and tranquility throughout the day. +Balance is a great oil blend to use during an AromaTouch® Hand Massage. +Apply doTERRA Balance to your wrists or neck to help ease anxious feelings. +Diffuse in your car during road trips to create a calming, soothing environment. doTERRA On Guard, a proprietary essential oil blend, provides a natural and effective alternative for immune support. As one of doTERRA’s best-selling blends, doTERRA On Guard protects against environmental and seasonal threats with essential oils known for their positive effects on the immune system. doTERRA On Guard can be taken internally on a daily basis to maintain healthy immune function and support healthy cardiovascular function. It can also be used on surfaces throughout the home as a non-toxic cleaner. When diffused, doTERRA On Guard helps purify the air, and can be very energizing and uplifting. +Add two to three drops in a veggie capsule for an immune boost. +Add to water for an effective all-purpose surface cleaner. +Soak sliced apples in water and a few drops for a healthy, immune-boosting snack. +Combine a few drops of doTERRA On Guard with Fractionated Coconut Oil for a natural hand cleanser. AromaTouch, doTERRA’s proprietary massage blend, combines the unique benefits of oils known to provide relaxing and comforting effects. AromaTouch combines our essential oils of Cypress, Peppermint, Marjoram, Basil, Grapefruit, and Lavender in a perfect blend that adds many important benefits to various massage techniques. 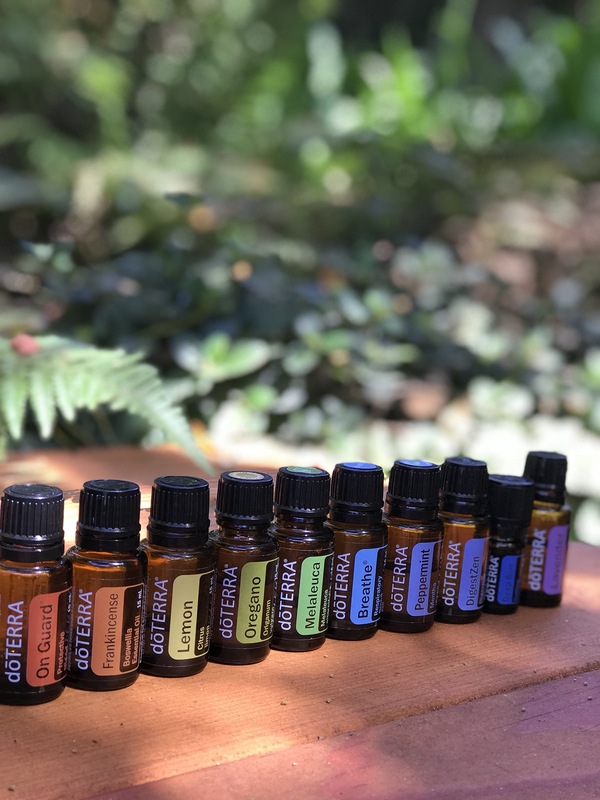 This popular blend is a vital part of the doTERRA AromaTouch Technique, a proprietary method for applying essential oils to produce a profound wholebody wellness experience. +Apply to neck and shoulders to promote feelings of relaxation and lessen tension or use with a carrier oil for massage. +Give your loved one a hand massage using the AromaTouch Hand Technique and AromaTouch Massage Blend. +Add to Epsom salts and enjoy soaking in a hot bath. doTERRA Deep Blue is perfect for a soothing massage after a long day of work. Wintergreen, Camphor, Peppermint, Ylang Ylang, Helichrysum, Blue Tansy, Blue Chamomile, and Osmanthus work together to soothe and cool. After long hours on the computer, try rubbing Deep Blue proprietary blend on your fingers, wrists, shoulders, and neck. A few drops of Deep Blue Soothing Blend diluted in Fractionated Coconut Oil can be part of a cooling and comforting massage. +Apply on feet and knees before and after exercise. +Massage Deep Blue with a few drops of carrier oil onto growing kids’ legs before bedtime. +Rub Deep Blue on lower back muscles after a day of heavy lifting at work or during a move. Lavender has been used and cherished for centuries for its unmistakable aroma and myriad benefits. In ancient times, the Egyptians and Romans used Lavender for bathing, relaxation, cooking, and as a perfume; it is widely used for its calming and relaxing qualities which continue to be Lavender’s most notable qualities. Lavender is frequently used to reduce the appearance of skin imperfections. Add to bath water to soak away stress or apply to the temples and the back of the neck. Add a few drops of Lavender to pillows, bedding, or bottoms of feet to promote a restful night’s sleep. Due to Lavender’s versatile properties, it is considered the must-have oil to have on hand at all times. +Add a few drops of Lavender to pillows, bedding, or bottoms of feet at bedtime. +Keep a bottle of Lavender on hand to soothe occasional skin irritations. +Freshen your linen closet, mattress, car, or the air by combining Lavender with water in a spray bottle. +Take internally to reduce anxious feelings. More commonly known as “Tea Tree,” Melaleuca essential oil has over 92 different compounds and limitless applications. The leaves of the Melaleuca tree were used by the Aborigines of Australia for centuries. They would crush the leaves and inhale the oil to promote feelings of clear breathing and apply the leaves directly to the skin for a cooling effect. Melaleuca is best known for its purifying properties. It can be used to cleanse and purify the skin and nails and to support a healthy complexion. Taken internally, Melaleuca promotes healthy immune function*, and Melaleuca can be used on surfaces throughout the home to protect against environmental threats. Melaleuca is frequently used on occasional skin irritations to soothe the skin and diffusing Melaleuca will help purify and freshen the air. +For occasional skin irritations, apply 1–2 drops of Melaleuca essential oil onto affected area. +Add 1–2 drops to water, citrus drinks, or veggie caps to support healthy immune system function. +Combine 1–2 drops with your facial cleanser for added cleansing properties, or apply to skin after shaving. +Apply to fingernails and toenails after showering to purify and keeps nails looking healthy. +Add a few drops to a spray bottle with water and use on surfaces to protect against environmental threats. Cold pressed from the peel, Wild Orange is one of doTERRA’s top selling essential oils due to its energizing aroma and multiple health benefits. High in monoterpenes, Wild Orange possesses stimulating and purifying qualities, making it ideal to support healthy immune system function when seasonal threats are high. As with many citrus peel oils, Wild Orange contains powerful antioxidants that help maintain overall health. It can be taken daily to cleanse the body or used on surfaces as a natural cleaner. Diffusing Wild Orange will energize and uplift the mind and body while purifying the air. Wild Orange enhances any essential oil blend with a fresh, sweet, refreshing aroma. +Use in an all-purpose spray to cleanse and purify surfaces. +Add a drop to your water every day for a burst of flavor and to promote overall health. +Diffuse to uplift mood and energy levels and to freshen the air. The peppermint plant is a hybrid of watermint and spearmint and was first described by Carl Linneaus in 1753. A high menthol content—like that found in the doTERRA Peppermint essential oil—distinguishes the best quality Peppermint from other products. Frequently used in toothpaste and chewing gum for oral hygiene, Peppermint also helps alleviate occasional stomach upset and promotes healthy respiratory function. Peppermint continues to be one of the best-selling favorites among doTERRA essential oils. +Use a drop of Peppermint with Lemon in water for a healthy, refreshing mouth rinse. +Add two to three drops to your favorite smoothie recipe for a refreshing twist. +Place one drop in palm of hand with one drop Wild Orange and one drop Frankincense and inhale for a mid-day pick-me-up. Plus, you get Fractionated coco oil for diluting your oils and making your own blends. AND the best part, you get a Petal home diffuser. The perfect way to get started on a more natural health journey – for the perfect affordable price! This kit will also come with a welcome gift from our team – click here to see more info on that or if you are ready to sign up for your own wholesale account – click here for the instructions. Introducing the Emotional Aromatherapy Touch roller set!